Lucia Boscaini is terrified of snakes! 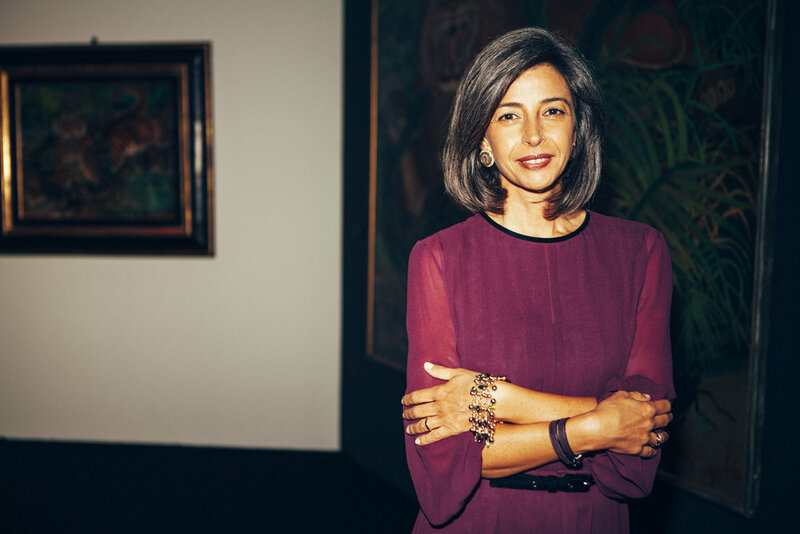 After so many years, the Brand and Heritage Curator of Bulgari has finally overcome her fears. Perhaps it is a way for her to understand and relate to such an important icon of the brand—the serpent. Born and bred as a true blue Roman, Lucia is passionate about everything serpent. She was recently in Singapore to oversee the Serpentiform being brought to life; an idea that she and her team of eight have been putting together since 2012. The exhibition has ended but the positive ripples from the show have given the brand a new confidence to continue its efforts in sharing the ideology of the serpent that has been part of the code of aesthetics for various forms of art since early civilization. The years of curating and piecing the ‘serpent’ together, scale-by-scale, has been translated into such a rich and mesmerizing scenography, which was divided into eight distinct chambers akin to the layout of Singapore’s Artscience Museum. Through her forward-looking vision, she has fascinated many fashion-conscious and heritage enthusiasts across the region. Serpentiform is not just a celebration of the past. As a heritage curator, she knows the importance of celebrating an identity, which is distinctively—BVLGARI. As a heritage curator, I feel my role is very exciting because it is such a projection of the future instead of dwelling in the past. For this reason, we wanted to celebrate an icon that Bulgari started at the end of the 40s but looking at it in the realms of contemporary interpretations. Out of eight rooms, only one is dedicated for antiquities because it is important to know our roots, our history and how many minds, legends, and religions have been linked to this day through different perspectives and symbols. Through continuous research for innovation and evolution, it has been interesting for me to realize how we’ve been interpreting the snake for many years in various ways. We have gathered over 60 creations but not one is identical to the other. It is about an unchartered discovery that we find through different pockets of time, history, culture and heritage. What inspired the idea of the ‘snake’? It was a very pragmatic start. We’ve been talking about snakes for many years since 2012 to be exact. But at a certain point years ago, we asked ourselves what else can we add on to this symbolic icon that Bulgari has been exploiting so much on? When we began searching for Bulgari’s interpretation of the snakes, it was a revelation! From that, we decided to try and conduct an exhibition based on the inspiring materials that were gathered. But we are a brand, not a museum. We don’t intend to create a deductible opportunity and we don’t intend to educate. It’s not our mission. We wanted to offer a sort of entertaining platform with learning content; merging the content (a very serious and extensive search behind each artwork) and combining it with a dramatic scenography, projection, and interactive tools. We’ve also included the augmented reality approach to the exhibition to make it an experience the visitors can enjoy while learning about the arts and the meaning of the snake. How do digital media affects the way exhibitions are created today? I think the advancements in the digital world have created a great tool to enhance the visitor experience. I have been running exhibitions over the years and what we did here wasn’t possible a few years ago. The quality of the projections has a 3D effect and it is the first time we are able to project the lights on the physical scales. The quality of realism using computer programming is an evolution and opportunity to always create something new that surprises the visitors. You’ve curated so many exhibitions over the years. Can you pinpoint a show that you’re extremely proud of and why? Of course, the Serpentiform is one because of its scale. But I think the exhibition that has the greatest impact is the one we had in Madrid called Bulgari and Rome. It was meant to show how the Roman roots of the company have impacted the style of the brand and we were able to get a few masterpieces from major Roman museums, which Bulgari designers from the past and present took inspiration from. Like the Serpentiform, the exhibition is not only about the jewel. We really wanted people to understand our inspiration, the art and the study behind the creation of a jewelry. For me, it is important to convey this message but in a pragmatic and tangible way. How has your approach evolved since your first exhibition? I feel like we’ve made a lot of evolution and progress. When we started, we had a traditional approach. We felt it was important to only talk about the Bulgari jewels. We were investing more on the art of the jewels; few pictures; minimal lighting effect; very content-focused but very rigid. In recent years, the digital media has trained us to be more exposed to different aesthetics. I believe we need to enrich the content with something that adds to the story-telling, imageries, sounds, visual effects and the overall experience. Do you work with specific music composers? Yes, we work with someone who selects the music and reedits it to match the scenography and thematic. We also work on fragrances to invite visitors to be immersed in the full Bulgari experience. In an exhibition this large, and only one room out of eight that is dedicated to Bulgari, the space has to be absolutely ‘Bulgarised’. The entire phenomenology is important to create a full experience that resembles Bulgari; the brand, identity and core values. What does it take to become a successful curator? A lot of work and a strong team! I wouldn't have been able to do it without my team. You have to be passionate about the work and the brand but that’s easy for me because I am Roman and Bulgari is so strongly perceived as the Roman jeweler. And on a personal note, I grew up dreaming of owning a Bulgari jewel when I was young. I also had the privilege to work closely with Mr. Paolo Bulgari 16 years back. The family shared with me their passion—they grew up with the company with a strong family history. So it was easy to absorb their passion as well. In retrospect, perhaps you can tell us something we don’t know about you? What do you know? (laughs) I’ve been with Bulgari for 16 years now from a completely different work—economics. But before that, I had a background in classical studies where I studied arts, Latin and Greek. When I started economics, I was happy because I like being stuck in reality, as I am a very pragmatic person. I went into accounting but realized how boring it was—too serious. Then I joined marketing for a mobile phone company. Life was made with some lucky moments. I learned marketing in a very digital environment and I jumped around the company. In 2001, Bulgari called me. They wanted to change their company from a family-run business to a big corporate company, which required a new and fresh marketing approach with the digital know-how. That is how I was hired. What are the challenges in curating historic art exhibition that includes such a rich tapestry of different feels and forms of arts? I wanted to mix the different types of art because this is typically linked to the identity of Bulgari. You’ll see here that the jewelry is made out of a lot of different materials, techniques and we continuously innovate to find new colors and novel material combinations. This is similar to what is happening in the art world today. Share with us the unique selling point of the Serpentiform exhibition. I believe it is the only exhibition that uses the snake as the main theme. It has a wide variety of art; sketches dating from the 2nd Century BC to artworks from 2016. It is really sort of a synthesis of the last 2000 years of arts that were inspired by the snake. What are your views on the appreciation of arts among young people these days? I question very much about it because I see a lot of modern art, contemporary art and established ones being quite attractive. I often read articles where many journalists and critiques say that contemporary art is disappearing because the concept of art is really changing. But we have too many ways, techniques and communication tools—such as Instagram—to display art. We are at a turning point; fragmentation is a risk but it is a great approach. I am curious to see how it evolves but I understand that we are in a very delicate phase for arts and artists. That’s why Bulgari is going to sponsor a prize for young emerging artists in partnership with an Italian museum. We want to contribute back to the art scene, especially for the younger artist. It’s easy to support super starts but we prefer to give a chance to the youngsters to also have a voice in the industry. What are your views on the fusion of Western and Asian culture? The stories are really similar. In China, it’s Nüwa and Fuxi but we know them as Adam and Eve—the first men and women. It is just unbelievable how parallel they are in terms of the legends and history. They were both the original human beings on earth and both stories involved a snake. In the Bible, the snake is the one who creates temptation and condemnation. There’s a negative connotation but in the Chinese version, the snake is a symbol of fertility; and the man and woman were half human half snake. It is interesting that in both stories talking about the origins of human beings, a snake is involved in two very distinctive ways. You have collaborated with so many artists particularly for Serpentiform. If you have a chance to work with one artist (dead or alive) to put up a show, who would it be and why? That’s a tough question because so many are dead. But if she were still alive, I would love to do something with Niki de Saint Phalle. She interprets the snake in many art pieces in a very colorful and childish manner. I like the fresh touch. There’s a sort of happiness and desire to look for something different; the snakes are always smiling and are all in different shapes. She also experiments with materials. In many ways, she is very close to the spirit of Bulgari—playing with colors, shapes, and materials with a happy approach instead of darkness and seduction. As a Roman, what is your favorite city and why? And if you were to retire to a city, where would it be? For retirement, I know it would be on a small island in the Mediterranean Sea—I don't know which one but I want to be surrounded by nature. In terms of a particular city, I really like Singapore. It is a place I would like to live in because I love the multicultural context and the interesting fact that the locals all have different cultural backgrounds. I really feel like this is a symbol of civilization and of the future. Plus, the food is so good. I cannot imagine living in a country where food is not good. I don’t like the big European or western cities like New York—it’s beautiful but it’s too stressful.